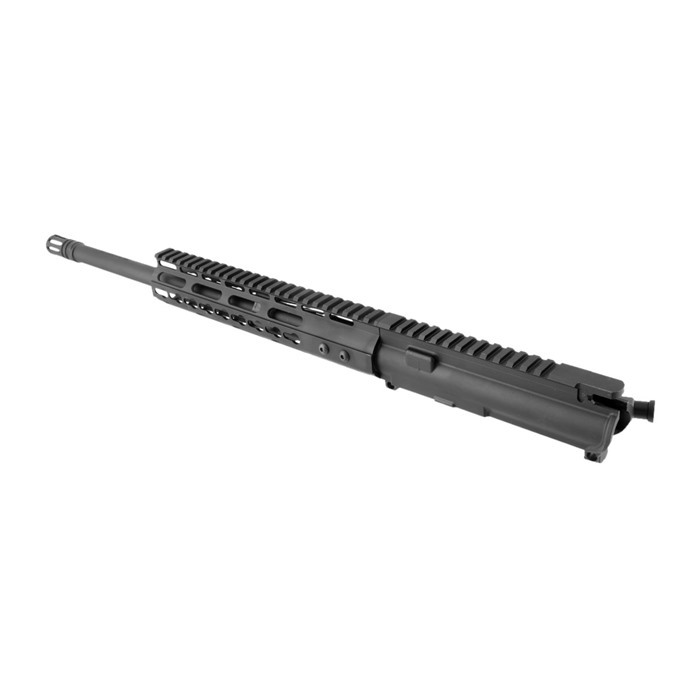 This Brownells’ exclusive AR-15 Upper Receiver is Made in the USA. Chambered in 300 Blackout and featuring a 16” barrel with a 1:8 twist. 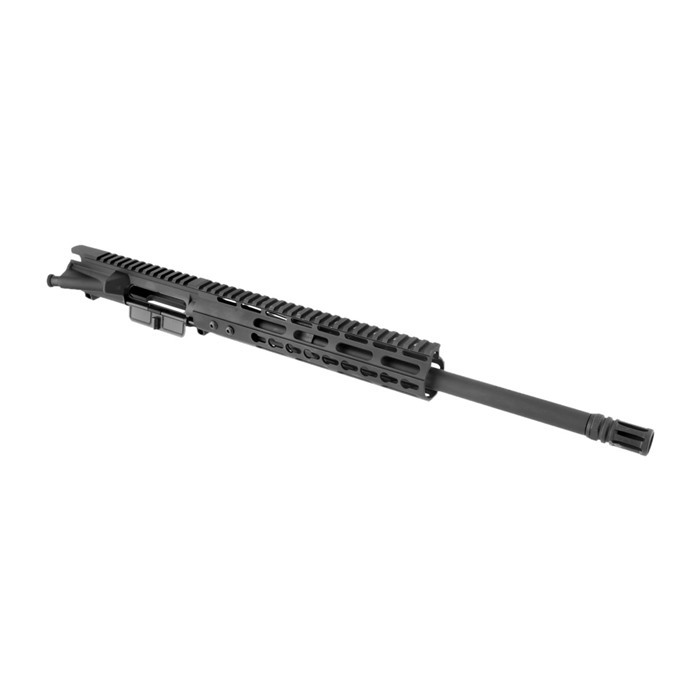 The standard A3 13-slot aluminum flat top receiver comes with a 10” handguard utilizing the KeyMod rail system. A low profile gas block, forward assist, ejection port cover and phosphate finish help to complete this package. Left out of this upper are the bolt carrier group as well as the charging handle so you can customize the upper any way you want! 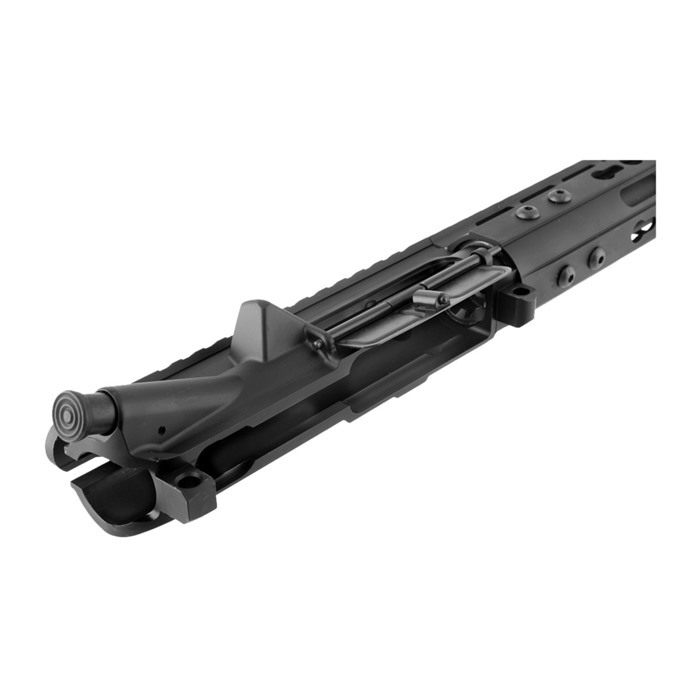 The A3 upper receiver will attach to almost any standard AR-15 lower receiver. Esclusivi AR-15 Upper Receiver di questo Brownells è Made in USA. Chambered in 300 oscuranti e dotate un 16" a botte con un twist di 1:8. L'alluminio di 13 slot standard A3 superiore piatta ricevitore viene fornito con un handguard 10" che utilizza il sistema ferroviario KeyMod. Un blocco del gas di basso profilo, forward assist, coperchio della porta di espulsione e fosfato finitura aiuto per completare questo pacchetto. Lasciato fuori questo superiore sono la freccia vettore gruppo così come la maniglia di ricarica in modo è possibile personalizzare la tomaia qualsiasi modo che si desidera! Il ricevitore superiore A3 verrà collegato a quasi qualsiasi standard AR-15 inferiore del ricevitore. Moa accuracy with Barnes tac 110. Tough to beat for $240. Purchased this upper as a Christmas gift for my son. We then had a chance to shoot it at a private range. Shot 100 rounds (80 super and 20 subsonic) and it shot accurately and functioned flawlessly. The upper fits perfectly with my son's Aero lower. 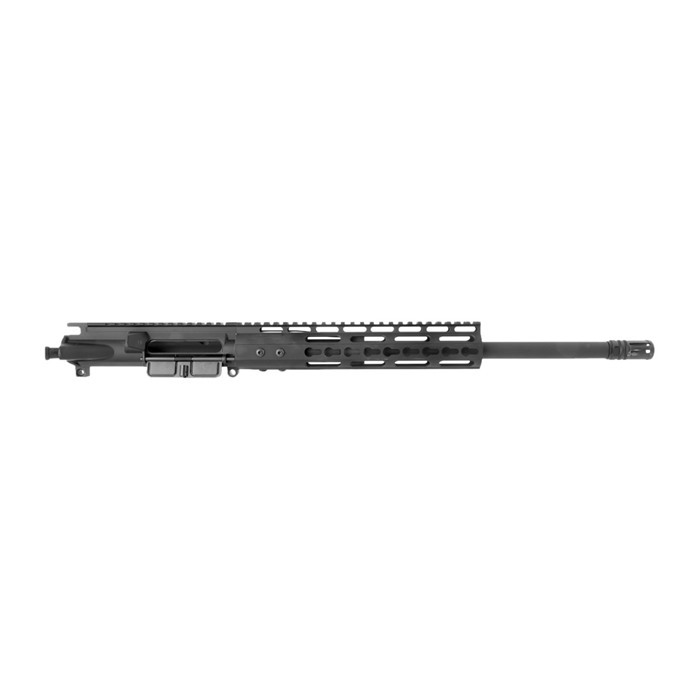 Great option for a low cost, high quality upper. Another fantastic Brownells product. Bought this upper in December 2016, was a little cautious about it since was a new product with only a few reviews. Also worried about the lack of quality since I paid just over $200 for it after being on sale and applying a discount. But Brownells return policy sold me. I had to run a bore snake down barrel and apply CLP to everything to get BCG/CH to operate freely. But that's nothing out of the ordinary for a new upper. The set screws on the handguard came loose after charging the weapon a few times, but after snugging them up I haven't had any other problems with it. Shoots right at MOA with Hornady 110gr v max and Remington 120gr UMC. Even my wife loves it and now my friends are buying them up as they come back in stock! I ordered this on a thursday it arrived on saturday! 3 days in my hand thats incredible! Packaging was very minimal and was open enough on one end it could have fallen out! First thought it might have been opened by a postal inspector but who knows? Other than that its a very quality upper well built and from the deflector marks it was test fired no less than 6 times. I got this item for fair price. It's not really premium quality but it is way better than your average budget upper! Be prepared to completely disassemble this item and build it the correct way. Nothing on this lines up. The gas tube is crooked and from the outside it looks straight. That means the gas block is also crooked. I really wish it was sent in pieces so I would know it was done right. Now I have to go to another vendor and buy materials to rebuild it. Poorly manufactured ATI Hobby Quality AR-15 Upper. Asked Customer Service who made it for Brownell's, all they could tell me was that it was made in the USA. Box came in and on the bottom it said ATI. The non-descript barrel, has no maker mark, ATI does not state on their web site what type steel is used for their barrels. Rail is poorly machined. I guess you get what you pay for. Installed this 300 BLK upper on a Bushmaster AR-15 carbine (specifically an XM-15) lower in a matter of minutes. Used the existing Bushmaster bolt carrier group and charging handle. Everything fit perfectly. My first concern was the weapon cycling properly with both sub- and super-sonic ammo and with both aluminum and polymer (P-Mag) magazines. Did a trial run using two Brownell aluminum 30 round mags and two Magpul 30 round P-Mag magazines. Put six 220 grain American Eagle OTM subsonic rounds in an aluminum mag and six of the same in a PMag. Then put six 120 grain Remington OTFB supersonic rounds in an aluminum mag and six of the same in a PMag. Fire the contents of all four mags without issue - the weapon cycled perfectly. Cannot comment on accuracy yet. Bought this for hog hunting. Good quality build. Fit and finish are excellent. Shoots great and is very accurate. Arrived from Brownells in 3 days. Good packaging with detailed inspection sheet with the receiver. Excellent value. The upper performs well and is capable of 1 MOA groups with handloads. I only gave it 3 stars as the gas block is too large and hits the forearm (not free floating). I had to replace the gas block, which Brownells provided. In addition, the forearm screws have different screw heads, which is sloppy work from the assembler. Decent upper but youâll need to some work. Parti Fabbricante: BRO300MS16KM10S Questo Brownells esclusivo AR-15 Upper Receiver è Made in USA. Chambered in 300 oscuranti e dotate un 16" a botte con un twist di 1:8. L'alluminio di 13 slot standard A3 superiore piatta ricevitore viene fornito con un handguard 10" che utilizza il sistema ferroviario KeyMod. Un blocco del gas di basso profilo, forward assist, coperchio della porta di espulsione e fosfato finitura aiuto per completare questo pacchetto. Lasciato fuori questo superiore sono la freccia vettore gruppo così come la maniglia di ricarica in modo è possibile personalizzare la tomaia qualsiasi modo che si desidera! Il ricevitore superiore A3 verrà collegato a quasi qualsiasi ricevitore inferiore standard di AR-15. Questo Brownells esclusivo AR-15 Upper Receiver è Made in USA. Chambered in 300 oscuranti e dotate un 16" a botte con un twist di 1:8. 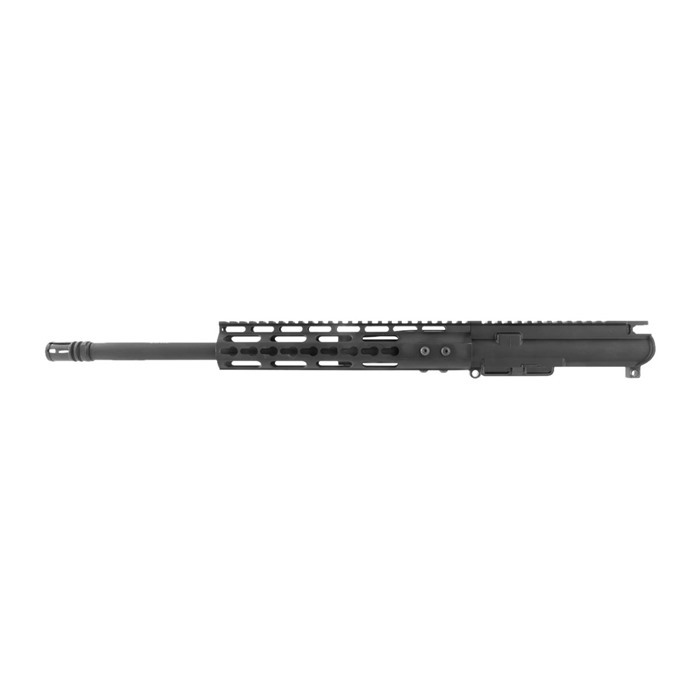 L'alluminio di 13 slot standard A3 superiore piatta ricevitore viene fornito con un handguard 10" che utilizza il sistema ferroviario KeyMod. Un blocco del gas di basso profilo, forward assist, coperchio della porta di espulsione e fosfato finitura aiuto per completare questo pacchetto. Lasciato fuori questo superiore sono la freccia vettore gruppo così come la maniglia di ricarica in modo è possibile personalizzare la tomaia qualsiasi modo che si desidera! Il ricevitore superiore A3 verrà collegato a quasi qualsiasi ricevitore inferiore standard di AR-15.